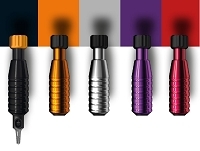 The Cheyenne Hawk Thunder is available in five colors – Black, Purple, Red, Silver, and Orange. This purchase includes a Hawk power cord and phono tip connector cord. An adapter cord is needed to use the Hawk Thunder with other standard power supplies and a Start-Up Facility Cord may be necessary if you are experiencing issues getting it started. If you are using a non-Cheyenne power supply, such as Eikon or Critical, set it on 12V and lower the voltage once the Hawk Thunder starts running. The Hawk Thunder is compatible with Cheyenne power supplies without additional equipment. 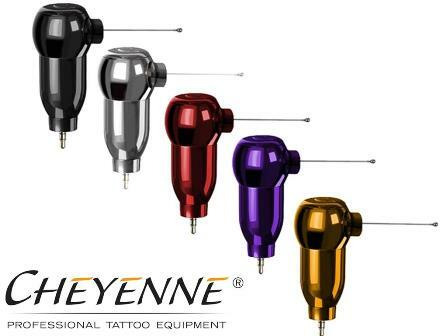 Please use only Cheyenne Hawk Needle Cartridges with this machine (Please Note: Use with non-certified Cheyenne Hawk Needle Cartridges will void the warranty). Resources are provided below for additional information, technical specifications, needle configurations, and more.